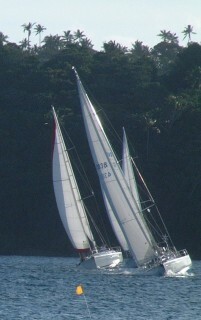 Every Friday afternoon they have "fun" sailboat races in Neiafu (capital of the Vava'u Group of Tonga), driven mainly by the 2 charter outfits here, Sunsail and Moorings. Chris and Amanda (and Jon) have enjoyed these, as well as the prize parties afterwards. Local businesses give out lots of prizes, and every boat gets at least 1. We have not (and probably will not) race Ocelot, but we like to crew on other boats. The best prizes (usually a wood carving or a dive trip or a whale DVD) usually go to cruising boats if there are any. Interestingly, prize value has nothing to do with how you finish. I think we've won 2 T-shirts, 2 breakfasts for 2, a laminated map of the Vava'u Group, a chicken and chips lunch, some DVD rentals and (finally) a 2-tank dive trip. The parties afterwards are in the 2 "yachty" waterfront bar/restaurants. Jon doesn't care as much for these (the noise from the bands comes over the water, so he can't sleep, so he tends to work on the website 'till late) but the kids love them. Strange to imagine ourselves sending our kids to a bar for the evening, but in Tonga they're perfectly safe. Three boats approach the mark. Exciting times racing boats in Neiafu. So last Friday, all 3 of us crewed on the same boat (somewhat unusual, although Amanda often crews with Jon on a Moorings boat - she's getting a GREAT reputation running the main-sheet). We were approaching the starting line, but we were too early, so we (and about 5 other boats) were doing circles just in front of the line, waiting for the gun. Jon had the most accurate watch, so he was calling off seconds, when the skipper gibed the boat. This is where the wind passes behind the boat, from one side to the other (as opposed to a "tack", where the wind passes in front of the boat). When gibing, the mainsail (the one behind the mast, above the horizontal boom) goes from being far out on one side of the boat to being far out on the other side, usually rather quickly. On Ocelot, we always pull the main in tight first, so it doesn't slam over as hard. We also shout "gibe-HO" so everyone knows (although our boom is high enough that it wouldn't hit anyone). This skipper did not call out when he gibed, and Jon was standing right in the path of the boom (paying attention to his watch). Another crewman knocked him down before the boom came across (if it hit the back of his head it could easily have killed him) and his forehead slammed into a deck fitting, opening a 2" long vertical gash (and a couple of smaller cuts) just at the hairline. He didn't think it was that bad, so we went on and finished the race (the accident gave us a bad start, but we eventually pulled a 3rd place). When we got back, Jon went to see our friends on Lady Starlight. They're both chiropractors, but Jim has been volunteering at the local hospital and doing some minor surgery there. He took one look at Jon and said that NO, a butterfly bandage was NOT going to work. So he got out his (excellent) medical kit and about 45 minutes later, he'd given Jon several locals (with some epinephrine to stop the bleeding), shaved away a strip on each side of the cut, put in about 25 very fine stitches, sealed it with some spray-on "new-skin", and washed away the puddle of blood Jon had left on the cushion under his head. Jon's not supposed to swim for about 2 weeks, which is a complete drag. He had to miss a nice scuba dive with Sue and Chris, but there'll be others. Other than that, we've been fine. Two nights ago we shone a light on the water and it was FULL of jellyfish. You could just about walk ashore on them. Very amazing - we watched them for ages. Our friends on Cookie Cutter (from Vancouver Island) want to cruise the Ha'apai Group, about 100 miles SSW of the Vava'u Group (all still in Tonga) so we're going with them. The Ha'apai are very remote and reputed to be wild and beautiful, with lots of (huge) fruit-bats, shells, beaches, reefs to explore (and avoid), etc. The charts for the area are terrible (actually, for all of Tonga and Fiji), so eyeball navigation is very important. Unfortunately, there's no wind today, so we're motoring. We have to make 60 miles to the closest anchorage and there's only 12 hours of daylight (and some reefs to see and avoid). So we're motor sailing with everything up (even the spinnaker) and doing 5-7 knots. We started at first light (about 7am) and the GPS is currently saying we'll arrive about 3:30 this afternoon, which should be fine. But the exciting news (besides the 2-lined mackerel we caught, our first in about 2 months) is the Humpback Whales. They've been all around us all morning. Pods of 2-6, spouting, breaching, spy-hopping, jumping, waving their white pectoral flippers and generally carrying on. One huge whale surfaced so close to us that I heard him before I saw him. VERY cool. They come to Tonga every year about now to calve and mate. Some whale trips here let you swim with them, which we hope to do when we get back to Neiafu. As far as future plans, those have recently undergone ... revisions. Chris has told us that, while he wants to enter university in the Fall of 2005, he does NOT need us back there to be with him. Since Amanda is game to continue cruising, we're planning to spend another year in the South Pacific. So we'll spend longer here and in Fiji. Those of you who were dreading our return can all breath a sigh of relief and those who want to see us sooner will need to checkout airline tickets to Fiji.